This is WOW News 247: France Threatens UK: Bloody Brexit Exit Looms EU? 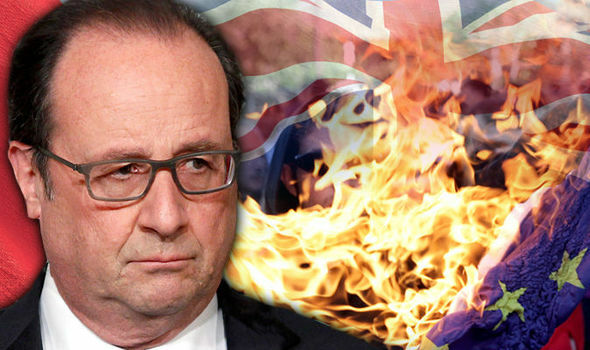 France Threatens UK: Bloody Brexit Exit Looms EU? FRANCE will make Britain PAY if people vote to leave the European Union on June 23. The eurozone’s second largest economy is determined to leave the UK with a bloody nose if it chooses to Leave and will ensure a divorce is sealed swiftly. In a thinly veiled threat to voters, French officials have warned they will shun Britain when it comes to establishing new immigration and financial rules in the event of a British exodus. The French will also push other EU members to take a hardline approach to Britain over unwinding treaties and agreements binding the UK to the 28-nation bloc, according to an EU source. A senior EU source said: “If we say you are outside the EU but can keep all of the advantages, access to the single market without any solidarity, it’s a terrible message for the rest of the EU. This is the latest doomsday message from an EU country increasingly worried about losing £350million gross figure that Brussels syphons off from British taxpayers every week. But there is speculation Paris may be acting in spite, as they work to crush the rise of anti-EU National Front who could make waves in the country’s 2017 presidential elections. France warns Brexit would restrict the “passporting” of financial services, which allows foreign-owned companies to do business with the EU via offices in Britain. In the event of Britain leaving the bloc, the EU may no longer recognise the British supervisory bodies, which could push firms to leave Britain and instead establish themselves inside Europe. Sylvie Goulard, French MEP who sits on the economic and monetary affairs committee, said: “I would be very tough. I see no reason to give passporting to a country that decides tin a sovereign way to leave the EU. On trade, EU members would have to curve a new relationship with Britain, something that would require the European Commission and debates in Parliament and Council. It is believed that Paris hopes Britain will adopt the Nordic trade model, which accepts all EU regulations including the free movement of workers in exchange for access to the single market. And investment links are also in the firing line as France - the second biggest investor in Britain - threaten to revaluate future involvement in the event of the UK leaving the EU. France, in 2015, has 124 projects in the UK, accounting for 8,198 jobs. The nation will have to tread carefully, however, in terms of visa and travel restrictions - France has 160,000 citizens living in Britain, who could be targeted in turn by visa restrictions on foreign travellers and workers if Paris looks to punish the UK. Another EU diplomat added: “People underestimate the rights of the EU citizen.